Pat's new harmony singing trio with Joe Jencks and Greg Greenway! Full news and tour schedule on the Brother Sun website. A fun way to stay in touch in short bursts (150 characters or less). I'll post a quick thought every few days. Keeps the flow going, between newsletters. 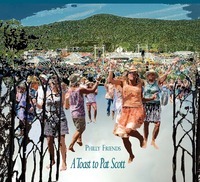 Videos of Pat Wictor playing live in a variety of settings: solo and in-the-round at festivals and clubs, totally "unplugged" under a tent at Falcon Ridge, and accompanying friends like Ellis and Joe Crookston. Cheryl accompanies me at many shows. She's an outstanding listener, improviser, and accompanist with great range and chops. Quality luthier, repair, and restoration shop for acoustic and electric instruments. Based in Huntington, NY (Long Island). FA organizes national and regional conferences to advance the cause of presenting live acoustic music. A wonderful site for blues fans, with a wide scope ranging from the acoustic Delta and Piedmont blues on up to contemporary electric blues, and including blues-rooted musicians on the rock and folk scenes. The site is run by Frank Matheis, veteran DJ and blues harp player, and the reviews are a rich guide to listeners looking to dig further into the blues. This is a myspace page for the "supergroup" I formed with my good friends Cheryl Prashker, LisaBeth Weber, and Maggie Marshall. Jayne Toohey, the "5th Philly Friend," provided photography and graphic design. All proceeds from the EP we recorded go to support Women In Transition (WIT), which provides empowerment counseling, referrals, and advocacy to women in the Philadelphia area who are endangered by domestic violence and / or substance abuse. See www.helpwomen.org for more information, to volunteer, or to make a donation.